The European Public Law Organization (EPLO) was created as an international organization with headquarters in Athens, Greece, with suitable governance, full international legal personality and status, upon the initiative of the Hellenic Republic, by the "Agreement for the Establishment and Statute of the European Public Law Organization", signed by several powers on 27 October 2004. 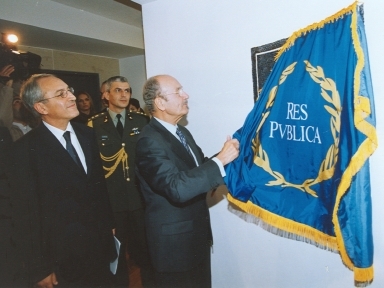 The creation of the EPLO became effective on 10 September 2007, upon receipt by the Depositary of notifications by three parties (Hellenic Republic, Republic of Italy and Republic of Cyprus) to the Statute that the formalities required by the national legislation of such parties with respect to this Statute had been accomplished. The signatory powers recognizin the General Assemblyin the General Assemblyin the General Assemblyin the General Assemblyin the General Assemblyin the General Assemblyed the importance of public law and the need to further promote its scientific, research, educational, training, institution building and other dimensions for a better generation of lawyers and democratic institutions worldwide, and the promotion of European values through public law throughout the world. The "Agreement for the Establishment and Statute of the European Public Law Organization" remains open for adhesion by other powers. Seventeen countries have already ratified the International Treaty establishing the EPLO: Greece, Cyprus, Italy, France, Estonia, Serbia, Moldova, Azerbaijan, Armenia, Ukraine, Georgia, Romania, Bosnia and Herzegovina, Albania, Hungary,Portugal and Bulgaria. The European Public Law Organization is indeed the continuation of the European Public Law Center (EPLC), which was established in 1995 under the law of the Hellenic Republic as a Greek non-profit institution of international character, aiming to the study and research, pure and applied, as well as to the training in all areas of public law in Europe, including national, comparative and European law. The EPLO has carried out extensive research activities in the direction of the creation of a European Public Law. It has organized and executed training programs, prepared studies, undertaken consulting activities, participated in international bodies and institutions of similar character and scope of activities. The EPLO has also aimed at promoting the rule of law and democracy in third countries, and has encouraged the study and application of law, democratic institution building, education and training. In over 20 years of activity, the EPLO has been involved in a variety of issues spanning from the in the General Assemblyinterpretation and comparison of legal systems to the proposition of innovative solutions for institution building, education and environmental protection. The EPLO has been actively present with its projects and activities in Europe, the Mediterranean Countries, the Balkan Area, the Caucasus and Former Soviet States, the Middle East, Central and South Asia, Africa, as well as Latin America and the Small Island Developing States.